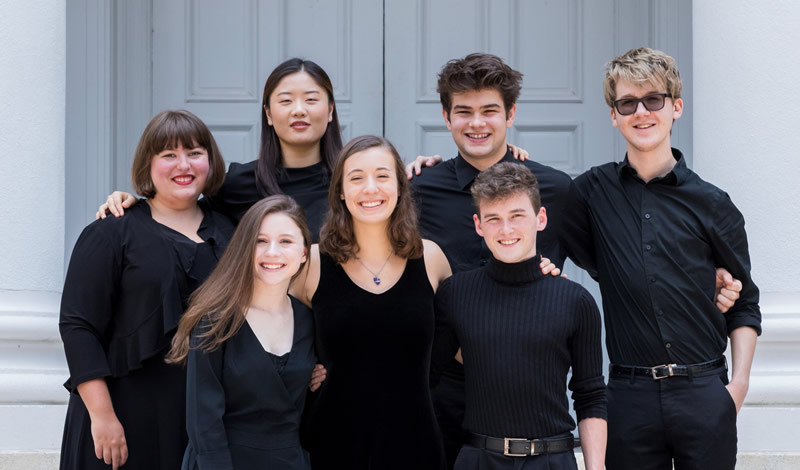 Seven outstanding young musicians presented themselves in front of their peers as the winners of the Eastern Music Festival's annual concerto competition. The competition is open to all students enrolled in the six-week festival held on the campus of Guilford College. Both student orchestras with their respective conductors, first José-Luis Novo and then Grant Cooper, shared the stage, exchanging places at the intermission. Both orchestras were in great shape but needed reining in as they frequently tended to overpower the soloists. Ela Kodžas, 19, a violinist from Rochester, New York, and a student at the Eastman School of Music, performed the first movement of Max Bruch's Scottish Fantasy, Op. 46. She has a powerful, lovely warm tone, especially in the lower register, although the orchestra (especially the harp) seemed bent on out-playing her. One rarely hears concerti for the double bass, but there are quite a handful to choose from, by the likes of Dragonetti, Dittersdorf, Koussevitzky, and of course, this evening's pick, Giovanni Bottesini. Written mostly in the pleasant upper register of the bass, the concerto makes effective use of harmonics, especially in the impressive cadenza. Perched on a tall metal stool, Johnathan Orion Miller, who at 15 was the youngest soloist of the evening, played the devil out of the Italian composer's Concerto No. 2 in B minor. Miller brought down the house with his impressive operatic finish. Hailing from New York City, he is enrolled in the Juilliard preparatory program. Asher Harris, 18, from St. Louis, Missouri gave an outstanding performance Aaron Copland's Clarinet Concerto, originally written for Glenn Miller. Although not my favorite work of Copland's, Harris made a very convincing case for the two-movement piece. His articulation was impressive as was his intonation. After intermission and the trading of orchestra personnel, we were treated to the first movement of Édouard Lalo's Cello Concerto in D minor with Abigail Leidy, 16, from Spotsylvania, Virginia, as soloist. The extremely forceful orchestral introduction marked ff and the insistent accents on the fourth beat of almost every other measure set up an expectation that no cellist could satisfy. However, Leidy did her best to boost her sound to that of the orchestra. The fact that there is very little staccato writing in the movement didn't help her to pierce through, but she made it clear that she has fantastic fingers! Here is a cellist to follow! Exuding confidence, harpist Morgan Short, 20, originally of Roanoke, Virginia, and currently a student in harp performance at UNC School of the Arts, played Gabriel Pierné's "Concertstück" (Pièce de Concert). There was no difficulty in hearing Short over the well-orchestrated and charming 1901 piece by the prolific French composer. It is not a profound piece of music, but it certainly is a good showcase for the harp! It took only four minutes for Jon McGarry, 20, of Wilson North Carolina, to establish himself as a rising horn virtuoso. He played the first movement of Strauss' Horn Concerto No. 1 in E-flat with power and lovely tone. He is currently a rising third-year horn student at the New England Conservatory of Music. Chinese-born Yihan Sun, 24, currently of Johnson City, Tennessee, but soon to enter the Peabody Institute's graduate school, treated us to a light, springy contemporary version of the last movement of Fréderic Chopin's Piano Concerto No. 1 in E minor. This was very clean and smooth Chopin, but I missed the lilt and rubato of a Stefan Askenase or an Arthur Rubinstein. Nonetheless, it is reassuring that so many young musicians show such great talent and concentration despite the intrusion of so many electronic devices in their lives.